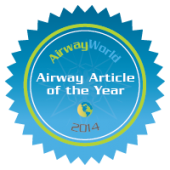 The winner of the third annual “Airway Article of the Year” award was announced during a live webinar hosted by AirwayWorld.com on December 5, 2014. Calvin Brown III, MD and Cheryl Lynn Horton, MD, hosts of the webinar, presented three articles as nominees. The nominees were chosen from among all of the articles covered during the Airway World Research Update webinars in 2014. The content and merits of each article were presented. Delayed sequence intubation: A prospective observational study by Scott Weingart, MD, et al. was chosen as the winner by a vote of the on-line audience during the show.